In an unfortunate incident which happened in Manimangalam near Tambaram in the outskirts of Chennai, two die-hard Vijay fans named Soundarrajan and Udhayakumar died on the spot after their bike collided with a lorry on Oct 1, the day of Puli's release. This sad accident came to the notice of Vijay and he decided to meet the families of the two deceased, this morning, Oct 6 at 6 am, and consoled the parents and families of both the departed young men. 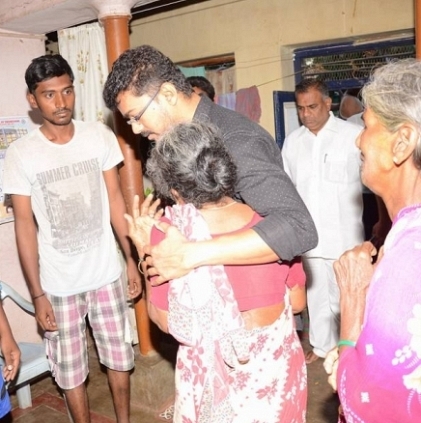 Vijay also gave financial aid and promised any sort of help in future too. Fans and the general public gathered in large numbers when they came to know that Vijay was there, and hence the star had to leave. We have to salute Ilayathalapathy for the great care and affection that he exhibits, not just for his fans but also for their families. People looking for online information on Ilayathalapathy Vijay, Puli, Vijay meets the families of his departed fans will find this news story useful.